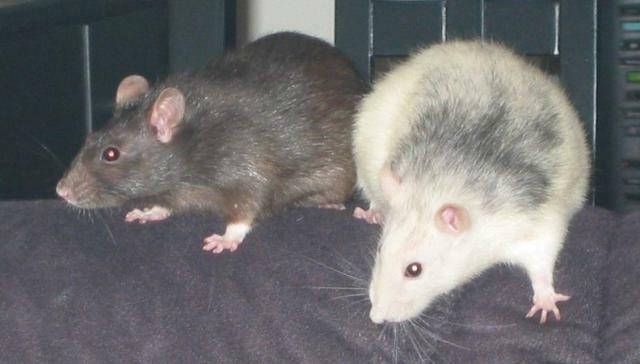 When Regina and I moved into our flat in Germering we quickly wanted to have some pet rats. We got them from a gothic girl we knew. Arwen was a beautiful, dark brown rat. Miriel was a husky whose back quickly became grey as she grew older. Both were very friendly personalities. Arwen got very old, almost exactly three years. She really was an old lady then, almost deaf, blind and skinny. But she had no cancer. Miriel was not so lucky: we still did not have a good vet and were forced to visit the bad vet that massacred Toxo. She still did not know how to operate on rats and so Miriel was untreated and eventually euthanized when the cancer grew too large. Still, she got almost two and a half years old. Arwen grew much older but eventually was so weak that she couldn't climb any more. Her rear legs got paralyzed. So we made her a new home on the floor inside a box where she lived for many months. And even though she could barely walk she still wandered around our living room. She was a tough girl.